If ECGridOS was brought to Market as a clone library of FTP code, or a YAAS2CO (Yet Another AS2 Connector), I should be rebuked; thankfully, however, ECGridOS is nothing short of a DSL – a domain specific language for creating virtual EDI Networks that route ecommerce messages globally via a cooperative system of interconnects. 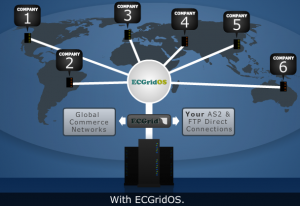 You create your EDI network with ECGridOS. So, EDI data is routed over ECGrid@ the network, and is programmed into your applications via ECGridOS the “EDI Communications Management Grammar”. But there’s more. Please read on about the delightful parts of ECGridOS that every developer discovers, but we just haven’t had time to write about and articulate. Look at the ECGridOS API DOcs, Look, Look !! There are Web Services functions for the management of trading partners and how they relate to specific mailboxes – hmmm. Just think on that one for a minute and check out the API Docs. You can store partner metadata and map relationships to specific accounts on ECGrid (as specific, allowed TP groups to Mailbox accounts). There is a class of API Calls termed, ‘EX’ calls – what means EX? This means that a multi-tenant host, a cloud B2B provider, can have administrative processes control over subordinate accounts from a privileged session – essentially allowing platform oriented management of a ‘segmented’ account space – where the Trading partner relationships, interconnections, account management, and other network attributes that a host or managed services department needs for EDI Network management. It’s in the ECGridOS API. 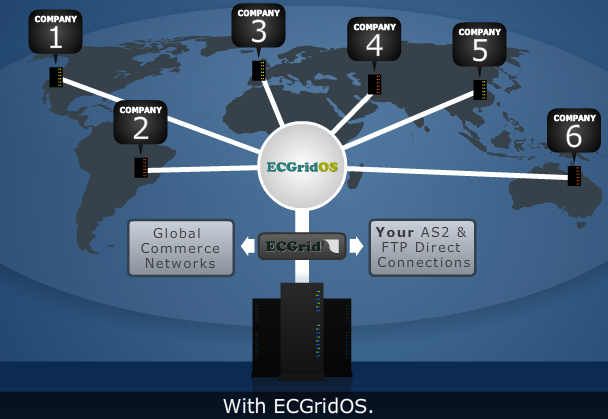 This is why we say in our song, “Be your OWN EDI Network, with ECGridOS“, because currently, (and for the foreseeable future, due to the power of ECGrid, the host network), there is no other means of creating your OWN EDI network, with this kind of controls over sessions, trading partners, and accounts. There are no other competitive offerings that come close. For those paying the bill for in-house AS2 and FTP, which costs dearly in equipment, power, and administrative labor, imagine the savings you can recoup by writing a few lines of code, and letting ECGrid act as your own EDI network, while you play white knight to your trading partners, who see multiple, un-routed AS2 connections as dead end’s to your hub. Blech. You eliminate or greatly reduce your in-house As2 / FTP clusters and associated power and admin costs. We help your partners with the migration via a simple script or a short call – we have completed thousands of migrations to ECGrid. You RAP with US ! This entry was posted on Tuesday, April 13th, 2010 at 11:51 am and is filed under blog. You can follow any responses to this entry through the RSS 2.0 feed. Both comments and pings are currently closed.